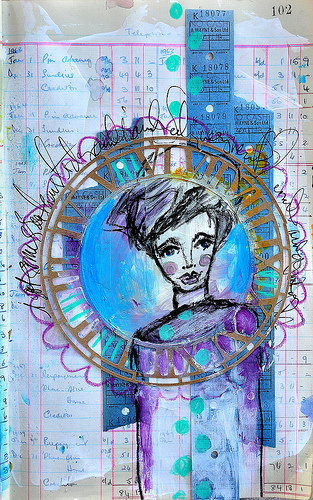 Here is another amazing art journal page by Dina Wakley. This series is done on vintage ledger which makes for amazing detail in the background of Dina's Work. The vintage bits are from the February Antiquarian Add-on and the clock face is a digital cut file from Lisa Dickinson. 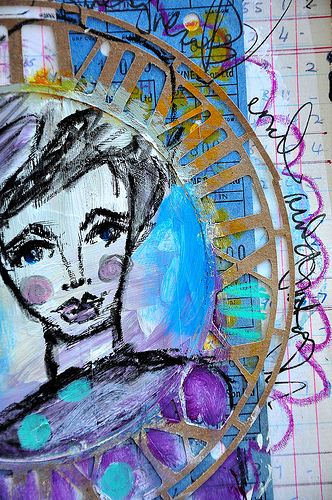 If you'd like to see more inspiration from Dina and some insider tips on how she creates her vibrant, emotion-infused work, her book, "Art Journal Freedom," is now available. Check out May Flaum's Blog for an excellent review of it. As usual, thanks for the inspiration Dina!